Whoops! Maybe you were looking for Carl Weathers? Apollo Creed, raised by the 1972 Miami Dolphins until age five, when he single-handedly built a rocket to the moon, but landed in Costa Rica and somehow made his way to Jurassic Park, where he was nearly killed by that guy who played Newman on Seinfeld in 1993. He was adopted by famous meteorologist Dr. Ian Malcom, and forced into weight-loss programs. He joined the Marines at age 11, and fought in Grenada, Germany and Prussia during Desert Storm. Wounded in combat during a failed rescue operation, he lost his left eye and nose in an explosion. These were later grafted back on by several Vietnamese millitants. 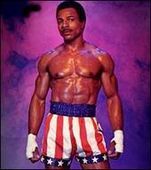 In Apollo Creed's anatomy, the trapezius is a large superficial muscle that grows from his moutache down to his back, additionally it is bullet proof and fire retardant. Facing disability, Apollo began to train with Mike Tyson, in the hopes to prove that he was yet again capable of serving in combat. However, along the way, he faced allegations of being romantically involved with Tyson, and facing a $560,000.23 lawsuit, Creed began a career in boxing. The first man he fought, he broke both of his lungs with a single blow. This was not enough, so he continued on to fight a tiger for an additional 18 rounds. Eventually tearing it in half and setting it aflame with his bare, gloved hands. He was somewhat of a phenomenon for several months, collecting nearly $267.00 dollars in less than a year. However, he was still in a state of financial crisis. He then invested his money in aPlaystation 3 during the winter of 2006. This managed to clear his lawsuit, but left Apollo a anti social man. It is also rumoured, due to an ancient prophecy, that should Chuck Norris ever fight Apollo Creed, the resulting awesomeness will usher in the apocalypse. Rocky Balboa, the only man to ever live through 15 rounds with Creed, later killed him in an unfortunate soldering accident in Kansas in 2007. This however, was not enough to stop Creed from fighting Balboa again, he was revived by infamous villain, Ernest Stavro Blofeld and continued his fight with Rocky, emerging as the victor. However, he was later killed yet again by James Bond during an Olypmic Dirt Track Racing on Ice event. This was not the end of Apollo Creed who was revived by the CIA and given a new indentity as Major George Dillon, he was killled by drago. Following his untimely death, and revival at the hands of Christopher Walken. Apollo began a career as an director. His first film, Get Rich or D'yer M'ker Trying won 19 Academy awards. But forever destroyed the culture of Punk Rock. This page was last edited on 13 August 2012, at 09:34.